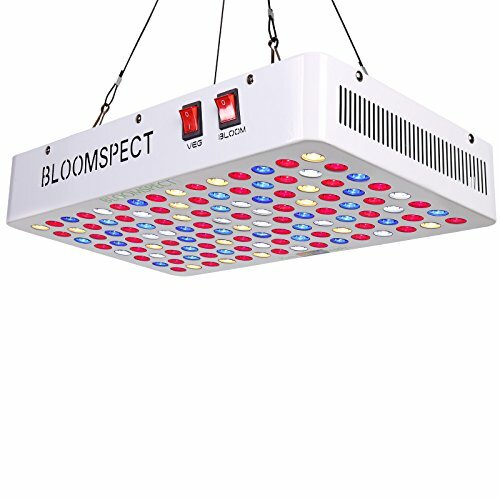 You won't need the sun with this high powered competitively priced 600W LED grow light that help keep any of your indoor gardening and hydroponics plants healthy and strong. The BS600 is suitable for all stages of plant growth, flowering and fruiting. It provides your plants with just the optimal amount of blue, red, and white spectrum at each stage of their growth cycle while producing bigger flowers and developing the natural appearance of your harvest. The results truly do speak for themselves with thousands of happy customers worldwide. Dimensions: 19.3" x 10.3" x 2.8"
Keeping heat off plants is essential. By using aluminum heatsink design to maximize heat dissipation area, the LED maintains a cooler temperature even after 24 hours of continuous use. Our lights have average lifespan of 100,000 hours. It uses far less energy and emits much less heat than fluorescent lamps. BS600 to replace a 600W HPS/MH but only consumes 268W of electricity. Perfect to cover a 4 by 4-foot veg area, or 3 by 3-foot flowering area. Secondary optical lens for high intensity light that penetrates all the way through the canopy. Built-in aluminum heatsink and cooling fans keeping your temperatures down perfectly. 3 years warranty plus 30 days money back guarantee. If you have any questions about this product by BLOOMSPECT, contact us by completing and submitting the form below. If you are looking for a specif part number, please include it with your message.